Miller, S. A. 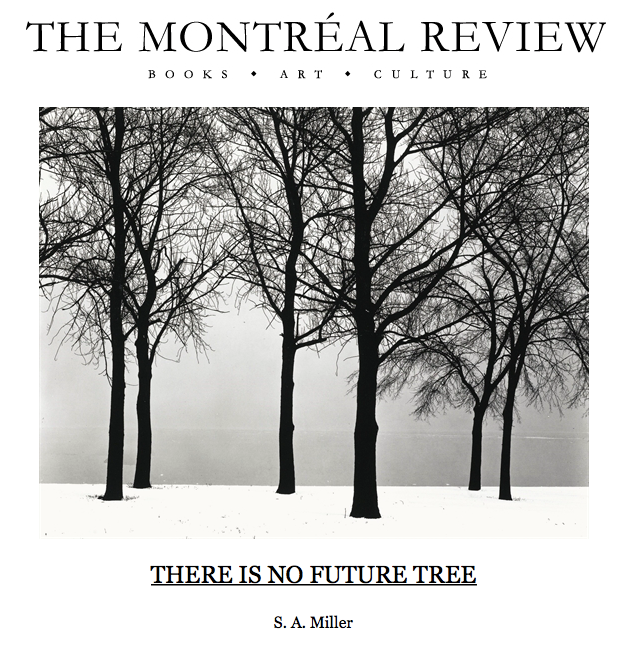 "There is No Future Tree; Or Time Works the Way You Think It Does," The Montréal Review (June 2016). Miller, S. A. "Guidelines and Suggestions," Crack the Spine (2016). Miller, Shawn A. "Slacker madness," Review of “Doing Nothing: A History of Loafers, Loungers, Slackers and Bums in America” by Tom Lutz, Sacramento News & Review (June 2006). Miller, Shawn A. "Consider the writer," Review of “Consider the Lobster” by David Foster Wallace, Sacramento News & Review (April 2006). Miller, Shawn A. "About The Nation," Review of “A Matter of Opinion” by Victor S. Navasky, Sacramento News & Review (July 2005). Miller, Shawn A. "A poet’s prose," Review of “Cutty, One Rock: Low Characters and Strange Places, Gently Explained” by August Kleinzahler, Sacramento News & Review (November 2004). Miller, Shawn A. "Desperate longings," Review of “The Curse of the Appropriate Man” by Lynn Freed, Sacramento News & Review (October 2004). I worked at the Daily Republic newspaper from 2001-10, though almost none of my work is available online. I may dredge up select tear sheets at some point and post them. Miller, Shawn A. "No bikers allowed: Skatepark excludes bicycles to little effect," Daily Republic (July 13, 2003). Miller, Shawn A. "Column: Timmy and shopping carts," Daily Republic (2003). Miller, Shawn A. "What Exactly is the Target? Comments on MacIntyre, Preston, and Technological Determinism." Presented at the Pacific Division Meeting of the American Philosophical Association, San Francisco, CA, March 30, 2016. Miller, Shawn A. “Tokens, Types, Causes and Criteria: A Response to Kwek on the Malfunction Problem.” Presented at the Pacic Division Meeting of the American Philosophical Association, Seattle, WA, April 6, 2012. The New Yorker's Sasha Frere-Jones recently criticized Eminem for remaining miserable and traumatized, for being unable to ease his own pain despite a more than decade-long career in which he has aired and re-aired his grievances with the world. But I think what separates artists from everyone else is precisely that they don't heal. Their injuries are permanent and their careers are spent meditating upon and describing their agony, which transmogrifies into tropes and themes and recurrences. Artists are able to structure suffering precisely because acute pain is not, for them, transient. We non-artists are amateurs at suffering, and our pain, to use a phrase from Thomas Merton, is "nothing but ugliness." It is amorphous and saturating, and we don't know what to do with it. Artists do. The reason that writing is such an agony is because it is a death march of decisions. If you are writing, then you are required to make a choice at every single point along the way. What I used to see as satisfaction at having written something, I now think is simply relief from having relinquished, temporarily, an onerous, and dumbly voluntary, cognitive burden. Teaching to write, accordingly, is simply to entreat another to suffer; it is to say, sit next to me and remorselessly foreclose possibilities, one after another. There is nothing behind a piece of writing; there is just the writing. The idea that prose can be transparent—that clear composition can somehow get out of the way and let the ideas shine through—is mistaken. It's as though we think that a computer screen's clear, sharp image is achieved when we see through it and on to the other side. There is no other side; a clear screen can only let you see itself, because there just isn't anything else to see. I don't understand why—in a world where writing exists—people give talks. Just write it down for me, then I'll give it a read and let you know if I have any questions. Everything about speech as a method of communicating complex ideas is inferior to writing. It's as though, having learned how to walk on two feet, a toddler reverts to the uncomfortable and inefficient business of crawling.